When I got to my to PC in the morning it had thrown up a strange X1 error about a window it hadn't seen before. I didn't bother to grab it. The X1 update window came up when I started it again. After that the install went well. Michael Devin wrote: ...the project without question impacted not only our ability to directly advance X1 Search at the pace we are accustomed, but also hindered our ability to support our forums at the standard we aspire to. Phew, with that task behind you, can someone clean out the "5103 posts waiting for approval"? All of it spam. I use the link but the version is still 8.4.., the path is wrong ? Again ? Kenward wrote: When I got to my to PC in the morning it had thrown up a strange X1 error about a window it hadn't seen before. I didn't bother to grab it. jpg's in the preview pane are now abnormally large. on 8.4.1 they were "regular size"
ne0031 wrote: jpg's in the preview pane are now abnormally large. on 8.4.1 they were "regular size"
Have you got the scaling wonky? Right click in the viewer pane gives me six options. I run scaling at 100% (default) as any other option causes problems for several of the applications I run. And even if scaling was enabled, why should there be a diff between 8.4 and 8.5? I have 15 (fifteen) options when I right click. ne0031 wrote: I have 15 (fifteen) options when I right click. This is context dependent. I was referring to viewing a jpg file. What file type throws up 15 size options? Kenward, we're looking into solutions currently. Hi, I have downloaded this version. I am using Outlook 2016. 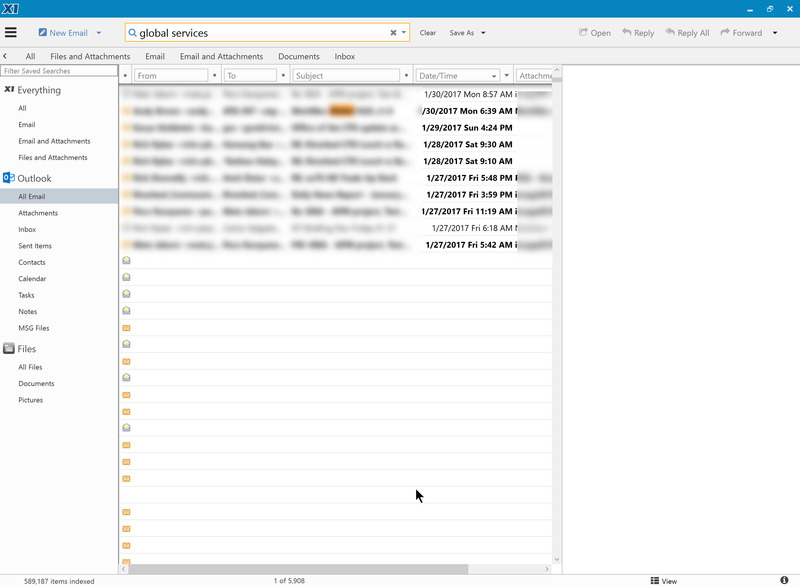 The issue I am facing is the drag and drop from X1 to Outlook emails doesn't work. Also if I select an email in X1 and clock the button "Send By Email", it takes ages to open a new email window - but at least it works. Any idea why it is happening? I think we went two different ways.... I was referring to the default view in the preview pane being abnormally large, the 15 items on right click comes from the result list. It seems that selecting "best fit" fixes the issue... and works between reboots. ne0031 wrote: I was referring to the default view in the preview pane being abnormally large, the 15 items on right click comes from the result list. Me too. But the default viewer is "intelligent". It changes depending on the file that you have selected. PDF files, DOC files and image files demonstrate different right-click options. Minor hassle - New 8.5 asks for licence details before installing upgrading from 8.4.1. RogerD wrote: Minor hassle - New 8.5 asks for licence details before installing upgrading from 8.4.1. But I had the beta version installed before this final release. skamble wrote: Hi, I have downloaded this version. I am using Outlook 2016. 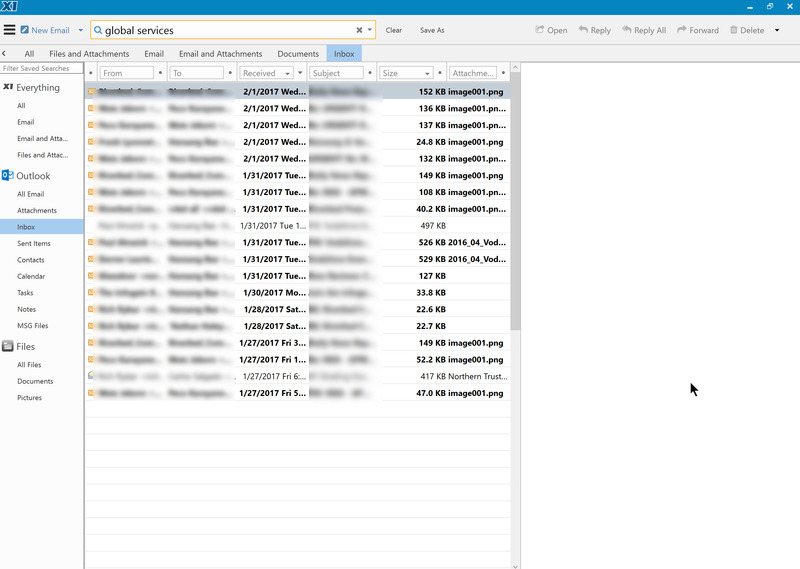 The issue I am facing is the drag and drop from X1 to Outlook emails doesn't work. What are you dragging? Documents (PDF files) drag here seamlessly. skamble wrote: Also if I select an email in X1 and clock the button "Send By Email", it takes ages to open a new email window - but at least it works. Again, the Outlook email window takes less than a second to come up. So both of these issues seem to be local rather than universal. HELP it doesn't work anymore after the update!! and then.. it stop working.. it stuck on "connecting to index services".. and after a while (several minutes like 10 or 15) it give an error like "unable to connect to index services"
uninstalled.. rebooted, installed, rebooted.. the same..
i cannot open X1 windows at all..
in the services I can see in the task manager. can you please help, I don't see any logs in the folder. I'm getting the same problem when I try to upgrade to 8.5. I have the same problem with the license. It ask for a license but do not accept my valid license information. Bug? How can I revert to 8.1? When I go to update to 8.5, it asks for License ID and License Password. I don't know what that means. I have a 16-digit registration #, but it won't accept that. I am a paid support customer, but when I go to summit this ticket in the support portal, I get "Page not found" upon hitting the submit button. Same here--I had a 8. 5 beta version. Uninstall the 8.5 beta and installed 8.5 GA, but 8.4 license did not work. Do I need to purchase a new license to install 8.5? Note: This message has nothing to do with the current release of X1. It is a warning to people posting messages here that there could be severe delays between when you post a message and when it appears. I am one of a handful of unpaid users (I pay for X1 too) who have "Moderator" access to this forum. This means that I see messages from people who are not "known" to the forum software. Those message get stuck in a queue until someone lets them out. For the past few months the official X1 team has been too busy writing software to clean out spam messages and approve genuine traffic. Unfortunately, over that period the forum seems to have become a target for Russians spammers and other reptiles. Fortunately, it gets trapped before it can annoy real users. I have raised the spam problem with the people at X1 several times over recent months but have had no reply, so I am throwing this warning into this discussion. If you are adding something to the forum, please be patient. It may not appear immediately. Apologies for disrupting the discussion of X1 – believe me, I have tried to deal with the issue with X1 directly without going public – but I did not want people posting messages to think that they are being cold shouldered. I just have to get some sleep at night. hyoshida wrote: Same here--I had a 8. 5 beta version. Uninstall the 8.5 beta and installed 8.5 GA, but 8.4 license did not work. Do I need to purchase a new license to install 8.5? Another user worked out how to get back in action. I've upgraded to 8.5 Release, and now X1 has stopped indexing. Im only indexing Files, Outlook email and outlook calendar. It will start indexing Files, but when it comes to about 25% it will stop and a msg pops "Connecting to search Services" and it will restart. Tried reboot and reinstall. Here is copy of the X1ServiceHost.exe.8.crash.xml that I saw requested in another thread in case that helps. But the upgrade seems to have broken things for me. The new UI is nice, I don't have scaling issues which is nice. But I can't find my emails. As you can see, whenever I type in search words, X1 shows me a few lines, 10 lines etc, and stops. I either get blank screen, or just the yellow envelope icon and nothing else. no From, no To, no Subject etc., and no preview. It doesn't matter if I do this in Inbox or All Email folder. I get the same problem. I'd rather not uninstall and rebuild my index from the start if I can help it. Do you have the preview pane turned on? It is hard to see. If you look at the status line, there is a View button. Click it for the options. If that isn't the issue, try showing a Alt+Printscreen screen grab that shows all of the X1 window. Thank you for your great support Kenward and your moderation efforts. Kenward wrote: Do you have the preview pane turned on? It is hard to see. And here's another example. http://i.imgur.com/0aslQCU.jpg You can see that bottom half is blank in the columns but you can see the envelope icon. I can't open any of these emails either. And I have "preview right" set in the VIEW option at the bottom. The blank screen that you see 3/4 of the way down is exactly what I see *and the problem*. In addition to preview not working. Before I blow away the index and try again, I thought I'd help debug it. 1. Sleep mode no longer functions correctly on my laptop. Instead, it shuts down completely, with re-start requiring complete reboot. 2. OneDrive seems to be crashing and re-starting at intervals. Both of these developments are most unwelcome! Where can I get support for my issue? the X1 start working again and it's not working anymore.. it's unable to connect to the X1 service host..
can someone from support contact me and help me resolve this issue? I am unable to use your product at this time. This is fantastic that new updated product has been released but I can't install it. I am still on Windows 7 (supported I believe) and when I run upgrade (either from X1 notification or from standalone installer) immediately after accepting T&Cs and clicking OK to accept that X1 will make changes to my computer it crashes without any additional info. I think there is an issue with X1SearchSetup.exe file. dariuszb wrote: I am still on Windows 7 (supported I believe) and when I run upgrade (either from X1 notification or from standalone installer) immediately after accepting T&Cs and clicking OK to accept that X1 will make changes to my computer it crashes without any additional info. After trying different things I have solved the installation issue. It seems that there is problem with http://download.x1.com/downloads/search ... hSetup.exe file. This is also file downloaded automatically when clicking at update from within X1. When I used manually downloaded http://download.x1.com/downloads/search ... Search.msi everything went fine and I am now using version 8.5. I had a very similar problem. After "successfully" upgrading from within X1, I could no longer see any of my emails. The list of emails would initially appear in the Results pane, but clicking on any of them would first result in a "Loading Preview" message, then a blank Preview pane. Shortly after that, I would get another message saying "Connecting to Service", then even the list of emails in the Results pane would disappear, and be replaced by a message saying "Loading Data". It was enormously frustrating, as I DEPEND on X1 EVERY DAY. Deleting the Index did no good. Doing a "Repair" did no good. I actually had to download the MSI file from http://download.x1.com/downloads/search ... Search.msi and do a Remove then Install to fix the problem. This has never happened before with X1 updates. All my email is gone from X1. It shows as indexed, but there are no email/results. dross333 wrote: All my email is gone from X1. It shows as indexed, but there are no email/results. Dross, I recommend you try what I did, in the post above. beachbt wrote: I had a very similar problem. After "successfully" upgrading from within X1, I could no longer see any of my emails. The list of emails would initially appear in the Results pane, but clicking on any of them would first result in a "Loading Preview" message, then a blank Preview pane. Shortly after that, I would get another message saying "Connecting to Service", then even the list of emails in the Results pane would disappear, and be replaced by a message saying "Loading Data". It was enormously frustrating, as I DEPEND on X1 EVERY DAY. Deleting the Index did no good. Doing a "Repair" did no good. I actually had to download the MSI file from http://download.x1.com/downloads/search ... Search.msi and do a Remove then Install to fix the problem. This has never happened before with X1 updates. THANK YOU! That seems to have fixed it. I was about to blow it away and go back to the previous version. Again, thank you!!! In the picture that I posted, you'll note that there were about 580K items indexed. And I had installed the update (via notice in X1) a few days ago. After I manually downloaded it this morning, I now have 685K. So something was jammed up for sure. Sad news. Today, after rebooting my computer for the first time, this problem has come back. I hate to think I have to uninstall and reinstall X1 every time I reboot. How can I go back to the prior version of X1? I look forward to the day when version 8.5 works properly. When I upgraded to 8.5, noticed a message in lower right corner of app saying "All connectors stopped: Low disk space". I have > 35 GB free on my hard drive. I have put in a support ticket, but wanted to share on the forum in case others are running into the same issue. I even tried going back to 8.4.1, but when I alunched that, it couldn't start the X1search service. So I'm currently running 8.5 with indexes that are a week out of date! JSx1 wrote: When I upgraded to 8.5, noticed a message in lower right corner of app saying "All connectors stopped: Low disk space". I have > 35 GB free on my hard drive. I have put in a support ticket, but wanted to share on the forum in case others are running into the same issue. Looks like it has hit several users. Re: HELP it doesn't work anymore after the update!! I had this issue and then for few days it worked. and now I'm back again. it's a week I cannot use anymore X1 again. I get the same error over and over. where can I get support for THis issue? is there a customer support that can help me? againa wrote: I've updated X1.. I recommend you follow the same path I described in a post above to go back to version 8.4.1. It was the only thing which got me functional again. BTW, when you do this, you have to do a COMPLETE uninstall. Allow it to delete the old files and indexes. I am running X1 8.5 build 6001qm on a freshly-installed and updated Windows 10 VM on Fusion on a Mac. This is a desktop Mac, so it is always up and running, and the VM is always up. Sometimes, when I come in in the morning, I find that X1 shows 0 messages in "All Email". I close it, reboot the VM, and it starts indexing, and hours later, finishes indexing the 300-400K messages. It works fine until the next time this happens. I have enabled "Store Outlook Email body in the index". Thank you for posting this. I started getting the "Cannot connect to Index Service error" yesterday, and 8.5 stopped showing Outlook emails (it would show files, though). My only recourse was to downgrade, and now everything appears to be working again. Needless to say, 6.7.4 is still working like a champ on my primary desktop with rarely a crash. I an also still drag and drop attachments from 6.7.4 to new emails -- a functionality that has inexplicably been dropped from the newer versions. The latest version is working very well for me. I received a message that 8.5 is available, I ticked the box to the right and clicked install. A screen then pops up X1 Search Setup and disappears after about 2 seconds and that's it. It's the same if I click on the menu/help/check for updates. How do In install the new program?